Nine of the Kappas gathered in September at the Town Club in Salt Lake City. Seated (left to right): Mimi Byrd Mortensen, Marie Barker Bennett, Jeanne Forrest Christensen, Virginia Isaacson Peterson, and Joyce Beck Barnes. Standing: Pat Warshaw Ferrin, Frances Johnson Darger, Jewel Johnson Cutler, and Kay Reynolds Patterson. Sorority Sisters for Life	These U Kappa Gammas have sustained meaningful connections for more than 65 years. The simple act of getting together monthly has kept a remarkable group of women firmly bonded since the late 1940s. They first met as U “coeds” at the Kappa house at 33 South Wolcott, where they played a lot of bridge. As they married and their families grew, they began meeting in the evenings. 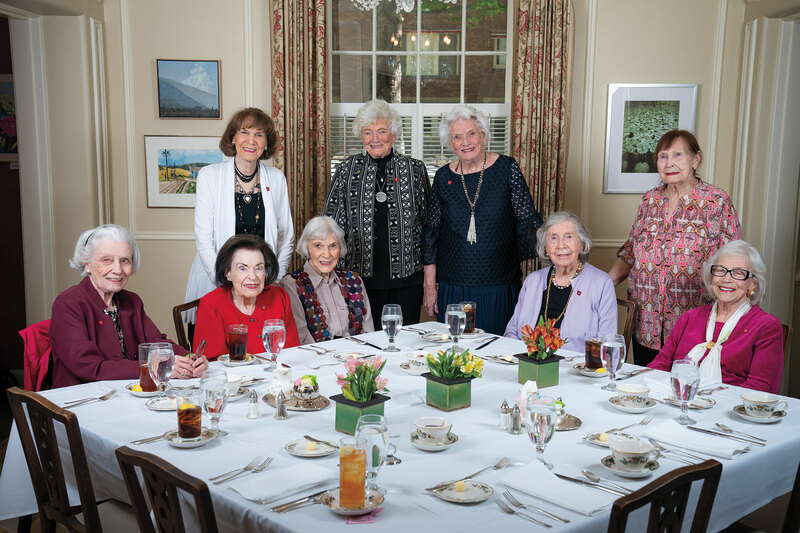 Now in their late 80s and 90s, the remaining 11 members now meet once a month for lunch, where they share updates on their lives and often have the occasion to sing “Happy Birthday”—which they’ve now been doing for more than six decades. Some are true pioneers, Erickson says, like Frances Johnson Darger BA’46, who played the violin in the Utah Symphony from the time she was 17 until she retired at 87. Darger’s sister, Jewel Johnson Cutler BA’48, who sang lead roles in U opera productions and was a longtime member of the Tabernacle Choir at Temple Square, is also a member of the group. Virginia Isaacson Peterson BS’47 spent decades making outfits for members of the Tabernacle Choir and laughs as she relates how so many of the women fibbed about their dress size. Joyce Beck Barnes BS’48 earned a degree in management from the business school and went on to own The Inn at Mazatlan, a popular destination for many Salt Lakers. Others in the group include Kay Reynolds Patterson BA’47 MSW’69; Marian Cheney Baldwin BS’47; Jeanne Forrest Christensen BS’49; and Mimi Byrd Mortensen JD’47. Some of the women have lost their spouses, but many are still married and serve as caretakers for loved ones. Not surprisingly, they take great pride in their families. Some were full-time moms, some worked full time outside the home, and some worked part time. Some are financially well off, while others are not. But no matter their paths, the bonds these women share are unbreakable. Their genuine affection for each other is palpable. And to boot, they’re still huge U sports fans. At a recent lunch in September, they were all aflutter, discussing the Utes’ latest football loss, some of them suggesting with good humor that they should coach the next game. Editor's note: Sadly, Marie Barker Bennett passed away Nov. 18, shortly after we went to press. Read an obituary here. Noteworthy news from featured alumni.